Doctors Without Borders revealed on Tuesday that nine of its staff members who had risked their lives fighting Ebola in West Africa have died. The fate of 16 other of their staff, who they said have also been infected, has yet to be determined as the battle to thwart the spread of the deadly disease wares on. The deaths reveal that even at well-quipped and properly staffed treatment centers the risk of infection is high, according to the Associated Press. Despite international efforts in the form of financial aid, the mobilization of troops, and volunteer clinicians from a host of organizations, Doctors Without Borders said it simply is not enough. 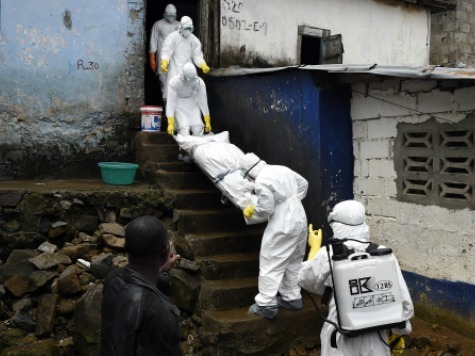 On Tuesday night, Guinea’s government put out a broadcast on national TV calling for the country’s retired doctors to return to the field in order to help battle the Ebola epidemic, notes the AP. “Where is WHO Africa? Where is the African Union? We’ve all heard their promises in the media but have seen very little on the ground,” said Sharon Ekambaram who is the head of Doctors Without Borders in South Africa, notes the AP. The United States has said it will provide an additional $142 million in aid to the millions they’ve already pledged to help fight Ebola. The funds will reportedly go toward building treatment centers, training staff to run them and supporting burial teams that do the dangerous work of collecting the bodies of those who have died from the disease, notes the AP. Liberia’s transport minister Angela Bush placed herself under voluntary isolation inside of her home over the weekend after her driver died of Ebola. The last time she saw him was on October 3. While she has not yet shown any signs of the virus, it could take up to 21 days for Ebola symptoms to start showing. A South African pediatrician with Doctors Without Borders, said her team made the difficult decision not to resuscitate babies unless they were newborn out of fear that the staff might become infected by bodily fluids, notes the AP. A Doctors Without Borders clinic in the town of Bo in Sierra Leone also made the decision to turn away pregnant women because childbirth reportedly poses a greater risk to staff. The first Ebola-related death in America was Liberian national Thomas Eric Duncan who passed away in Texas just over one week ago. He had contracted the deadly hemorrhagic virus from a pregnant woman that he was trying to help save back in his home country.